South Africa's governing ANC party has accused the Zimbabwean government of "riding roughshod" over democracy and said a fair election is not possible. A BBC correspondent says this is the strongest statement so far by the ANC on Zimbabwe and a sign of mounting diplomatic pressure on its government. 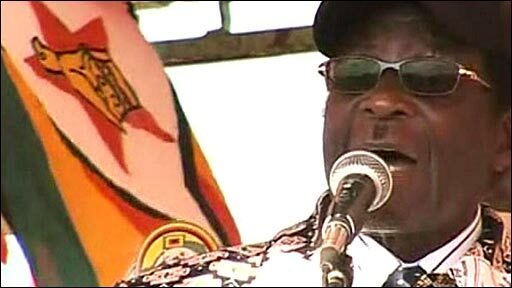 The regional bloc Sadc is due to hold an emergency summit on Zimbabwe's political crisis, reports said. 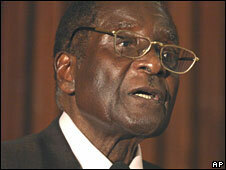 President Robert Mugabe insists the vote will go ahead despite UN concerns. Speaking at a rally in the town of Banket, he said: "They can shout as loud as they like from Washington or from London or from any other quarter. Our people, our people, only our people will decide and nobody else." Zimbabwe's opposition Movement for Democratic Change said it had confirmed in writing on Tuesday its withdrawal from the presidential race. The pull-out was announced at the weekend by the party's leader, Morgan Tsvangirai, who cited widespread violence as the reason. Southern African leaders will meet for emergency talks called by the Southern Africa Development Community (Sadc) in Swaziland's capital, Mbanane, the Tanzanian president's office said in a statement. The announcement came hours after the ANC said it was "deeply dismayed by the actions of the Zimbabwean government - which is riding roughshod over hard-won democratic rights". It said it could not remain "indifferent to the flagrant violation of every principle of democratic governance". And the party referred to "compelling evidence of violence, intimidation and outright terror". The comments come a day after the UN Security Council unanimously agreed to condemn the violence in Zimbabwe and said a fair election would be "impossible". The BBC's Peter Biles in Johannesburg says that coming from South Africa - the most powerful country in the region - the ANC statement is a further sign of President Mugabe's growing isolation. Mr Mbeki has been adopting a policy of "quiet diplomacy" towards Zimbabwe. There had been reports on Tuesday that Mr Mbeki would return to Zimbabwe to hold talks with government and opposition leaders. However, his office denied that that was the case. In separate comments, ANC leader Jacob Zuma, who rivals Mr Mbeki as South Africa's most powerful man, said the situation in Zimbabwe was "out of control" and called for urgent intervention by the UN and regional Sadc grouping. Meanwhile, Mr Tsvangirai said he would leave the Dutch embassy in Harare sometime over the next 48 hours. Mr Tsvangirai, who took refuge there on Sunday night, hours after pulling out of this Friday's vote, said the Dutch ambassador had received assurances from the Zimbabwean authorities about his safety. Senegalese President Abdoulaye Wade, in a statement about his attempts to mediate in Zimbabwe, said Mr Tsvangirai had been fleeing soldiers when he took refuge. BBC world affairs editor John Simpson, who is in Harare, says few people in Zimbabwe know Mr Tsvangirai has pulled out of the race as official media barely ever mention him. Meanwhile, Zimbabwe's UN ambassador Boniface Chidyausiku told the BBC Mr Tsvangirai, who was briefly detained five times while campaigning, had never had his movements restricted by the authorities. "He's a cry baby... He has been free to move wherever he wanted to move," he said. The opposition says some 86 supporters have been killed and 200,000 forced from their homes by Zanu-PF militias but the ruling party blames the MDC for the violence. Meanwhile, the BBC's Themba Nkosi in Bulawayo, south west of Harare, is reporting that youths and villagers from an MDC faction have this week been ambushing and attacking pro-Zanu-PF so-called war veterans in the area. In Mashonaland West, another BBC contributor said Zanu-PF youths abducted MDC councillor-elect Lavender Chiwaya at his house on Tuesday morning, beating him before he was released by another MDC official. According to official results, Mr Tsvangirai was ahead of Mr Mugabe but failed to gain enough votes to avoid a run-off. Are you in Zimbabwe? Have you been affected by the violence? Tell us what's happening where you are using the form below or by text on +44 7786 20 50 85 - and let us know if you do not want your full name to be published.